It’s been more than a decade since Animal Liberation Orchestra (ALO) emerged from the keg parties of Isla Vista to unleash their jams on the music-loving universe. 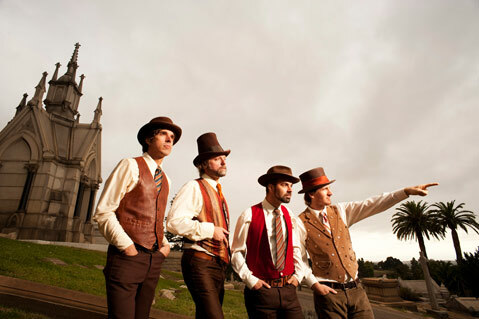 This month, the Bay Area-born, UCSB-educated minstrels of toe-tapping melodies release their sixth studio album, Man of the World — their third on Jack Johnson’s Brushfire Records — and will be hitting up SOhO on Valentine’s Day for their fourth annual Tour D’ Amour. ALO’s singing pianoman Zach Gill, who’s also been playing keys for Johnson since 2005, recently chatted with me over the phone about the new album while relaxing in his home near Goleta’s Ellwood Bluffs. Tell me about Man of the World. The making of it was a very different process for us. In the past — and ironically, since we are such a live band — we would get in the studio and do things track-by-track, starting with the drums, then the bass, then the keys, then the guitar. In this case, we did everything all at once in the same room, which meant that if one person made a mistake we had to go back and do it all over again. We had to get the take as a group. It was a good experience for us. It was a little bit like those four-legged races where everybody’s tied together. At first, you realize how much everybody else’s instruments are on your track, so that was kind of difficult, but it created a new camaraderie, and that was awesome. Right from the get-go, the songs sounded really good and full without having to put a lot of layers onto them. It was more like what we would do live. How was recording in Hawai’i? It was great. It was sunny, but we were in the studio a lot and studios are studios. The nicest thing was having Jack there. The last couple of albums we haven’t had a proper person from outside the band in there with us the entire time. His presence made decision making a lot easier, having that outside perspective. We also wanted to find a neutral ground, where people would leave behind everything else. Hawai’i was definitely that kind of place. According to the liner notes, Jack was also quite involved in the writing of this album. He and I have been doing so much stuff together, it was sort of a natural progression. In this case, we [the members of ALO] decided to do the album pretty quickly. In previous years, we’ve had a bunch of songs sitting around that were already done and went into the studio to record those. In this case, we didn’t go in with too much preparation. We wanted to have a clean slate. There was a lot of lyric writing on the spot, so Jack is obviously a great person to have around for that sort of thing. And more so than any of our other albums, this one felt the most collective. Maybe that was because there were a lot of things that were not worked out yet when we got to the studio. You had plenty of help from family members too, as your daughter and Jack’s kids are also on the album. That’s one of the next things about the whole vibe over there — it’s very family friendly. I love it when my daughter sings with us. Do you still tour with your family? They come when they can, but it’s getting a little trickier as she gets older. She has her own deal. She tried out and got a good part in The Fiddler on the Roof, and that happens to be the same weekend as the Kokua Festival. But come the summer, she’ll be at a lot of stuff. Both ALO and Jack seem to be proponents of the family tour. Yeah, and the kids seem to love it, as long as you have a good crew of people who know what it’s like to have kids around. It kind of puts everyone on better behavior to a certain extent. Is touring with the family still a rare thing in the rock music world? I suppose it is still rare, but it’s kind of how ALO started. When we started touring my daughter was two and we took her wherever we could bring her, and Jack’s done the same thing. It’s kind of all I know really. It seems like, for bands, having a kid is either the deal-breaker or the right thing that kind of makes it. I decided early on that it would have to happen. [ALO’s guitarist] Dan [Lebowitz] just had a baby, and he’s like, “If I’m gonna tour, I’m bringing her.” He laid down the line, and everyone’s cool with it. So tell me about the tour. I hear that you’re playing the Olympics? [Laughs.] We are. Honestly, I’m just sort of holding on. I haven’t totally checked out the itinerary, but I’m just really excited about getting the guys all together. We took most of 2008 and 2009 off, so it feels nice to get the thing rolling again. I’m looking forward to being with everybody. Last time we spoke, we talked a lot about the challenge of crossing a jam band like ALO over in to the more popular music realm. How’s that going? On this album, we intentionally steered back toward the jam. We decided to make a conscious effort to not worry about those sorts of things, but to let them take a backseat and let the music guide us. That felt really good. It’s not that we were trying to be something that we weren’t before, but I think that the truth about our band is that we write songs, then we like to take them and pull them apart and improvise over them. That’s true to what we like to do, so I think we’ll just kind of keep doing that. The song is one context and the jam is another. The thing for us is finding people that appreciate both. But I think it’s happening, and this album is a good representation of that. It doesn’t feel like anything is truncated — it’s very open and expansive — but there are still some short songs. It feels good, and it also feels like it will be really fun to play these songs live. What the hell is “The Country Electro”? Good question. The country electro is a loose theme for the album. For awhile we were calling the album Before the Country Electro, but we thought it would be a little too confusing. Once we started compiling all the songs and all the lyrics, we realized that there was a subtle story about a man going on a trip, on a voyage. It could be inside his own mind or he could be a pioneer or a sailor of some kind. It definitely has some man trying to figure out his own nature and why he does the things that he does. It’s a little like man playing with fire — and that’s another theme, man and fire. That’s why we have matchbooks on the cover and matches inside. Once man got fire, we were in pretty good shape for everything after that. In all the old mythology, it’s a big deal when man gets fire. It’s usually some god who gives it to man. It’s obviously a big moment in the human consciousness and evolution. The matchbook is such a perfect thing. Not only did we get fire, but we figured out a way to put it in this little book and to put little advertisements on the outside of the little books. I don’t know when the match was invented, but it’s an amazing invention. It lets you warm yourself up, gives you light to read by. That’s very powerful magic at almost any time in history. That would be so coveted. So everybody’s got the fire now, but we always want more fire. Or just a lighter. Or the iPhone. Except that’s one step removed. I don’t think you can burn things down with the iPhone. But who knows? Some people say a lot of crazy radiation is going on with the thing. ALO’s Tour D’ Amour Four comes to SOhO on Sunday, February 14 at 8 p.m. Call 962-7776 or visit sohosb.com for tickets and info. And for more ALO, visit alomusic.com.